Your resume probably includes one kind of information: historical data that tells an employer who you are, where you came from, and what you did. It may also list skills that may or may not be transferable to a new job. None of this information tells an employer what you can do for him. The resume leaves it up to the employer to figure that out for himself. That's no way to market yourself. But that's all the information 99% of resumes contain. That's why most resumes get no response from an employer. Give before you expect to receive. It's an old marketing adage that says, give the customer a sample of your product before you expect him to buy from you. That gets the prospective customer hooked. It gives him or her a reason to want more. It also accomplishes the critical goal of proving to your customer how good your product is. Do the same with your resume. Give the prospective employer a free sample of what you can do for him. This will get the employer's attention, and it will distinguish you as a job hunter whose goal is to do the job for the employer, rather than just to get a job. How do you put a free sample of the benefits you offer an employer into your resume? This popular article has been revised and expanded into a full section of Nick's new book, the How Can I Change Careers? Answer Kit. Please click for more information and to view samples from the book, and to learn how to change careers successfully using the methods described throughout Ask The Headhunter. 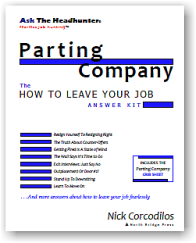 This 36-page book includes a crib sheet to help get your career change on track�and to help you keep it there!